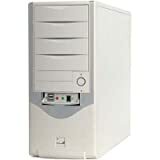 Our brand new Pentium 4 PC MID Towers! NOTE: Specs will change as we acquire faster, more powerful components for our customers. Contact us for the latest quotes - in this ever-changing technological universe!